These raw pancakes are rich, fluffy, and so soft. 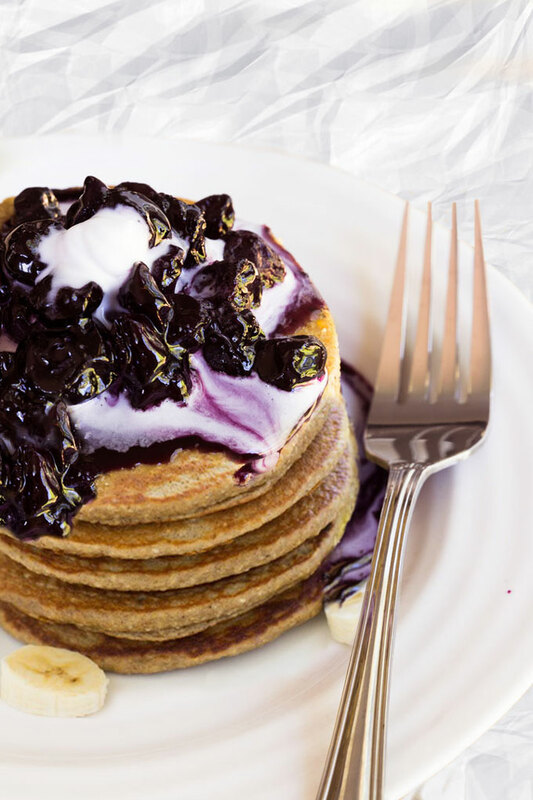 Topped with some freshly whipped coconut cream and reduced maple-blueberry sauce, they’re to die for. Feel free to play around with different spices and toppings to make really interesting and delicious combinations. Pancakes are one of those foods that have somewhat of a mystique about them. When I hear the word pancakes, I think of my mom, weekend mornings, and a smell of something delicious wafting throughout the house. Most families have pancake traditions because let’s face it – a stack of warm pancakes, especially banana pancakes, can make everything better. This recipe feels like a small victory to me because I’ve been trying different raw pancake recipes for quite some time. Especially now that summer is on the way, I try to incorporate as many raw foods into my diet as possible. When it comes to breakfast, I usually stick with smoothies or homemade granola with almond milk. However, every now and then I crave something with more texture – something like these raw pancakes. I have to admit that raw pancakes take more time to make than your regular cooked pancakes. So what I do is make the pancake batter the day before in the afternoon and then dehydrate the pancakes before I go to bed. When I wake up the next morning, not only are the pancakes ready, but the entire house still smells like heaven. There’s nothing like waking up to the smell of maple syrup, vanilla, and a hint of cinnamon. My husband likes to top these pancakes with some more bananas and maple syrup, which does taste amazing. But my favorite combo is reduced blueberry sauce and coconut whipped cream or this raw instant jam. Yum! 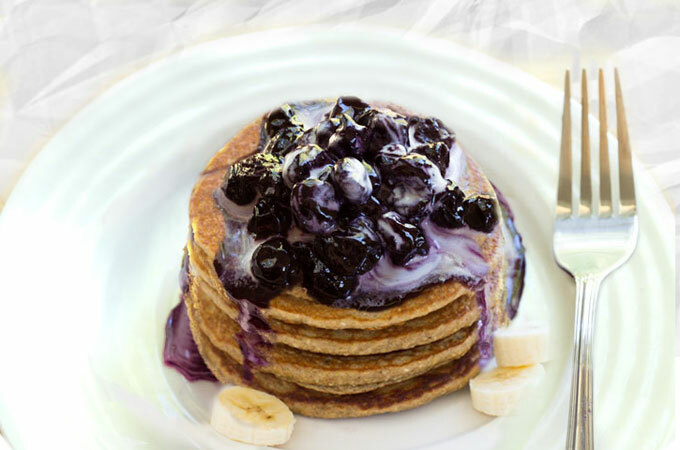 I’ve always liked banana pancakes so I had to incorporate bananas into this recipe as well. They provide a hint of sweetness and make these pancakes light and fluffy. If possible, use ripe (better yet – over-ripe) bananas. Unripe bananas have a high resistant starch content, which may cause some bloating and gas. As the bananas ripen, the resistant starch content changes to simple sugar, resulting in sweeter bananas. 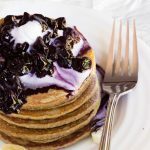 Another essential ingredient in these raw pancakes are golden flax seeds. Depending on where you live, you might have a hard time finding golden flax seeds (brown flax seeds are much more common). However, any health food store should carry them. If not, buying them online might be your best bet. Golden flax seeds are not only lighter in color – obviously – but also lighter in flavor compared to regular brown flax seeds. While this recipe does call for almond milk, you might not need to use it. As a rule f thumb, the less almond milk you use, the better. More liquid results in a longer dehydration time. So don’t add the almond milk till you know you need it. The amount of almond milk you’ll need (if any at all) depends on how ripe your bananas are (the riper the bananas, the less liquid you’ll need) and how absorbent the dry ingredients are. Also, keep in mind that you want the pancake batter to be on a thicker side so the pancakes don’t spread out once shaped (see the “Use a circle form” point below). If you want your pancakes to be extra smooth and fluffy, run the batter through a blender. Blending will eliminate any chunks and yield smooth pancakes. The mix should be similar to regular pancake mix. I like to make my recipes look as amazing as possible. After all, food is a form of art. That’s why I use a large cookie cutter to create perfectly round pancakes. The batter shouldn’t spread in the dehydrator so you can remove the cookie cutter once you’ve shaped the pancakes. I actually do recommend removing the cookie cutter because the batter tends to stick to it if you dehydrate the pancakes with it. Since these pancakes contain bananas, you’ll want to have the pancakes done as quickly as possible. The reason is that bananas tend brown with time. So the longer it takes you to dehydrate these raw pancakes, the darker they’ll turn out. If you’re wondering, no, browning doesn’t affect flavor. However, I think that pancakes should have a somewhat golden color. Since every dehydrator is different, I can’t give you the exact time it will take to dehydrate these pancakes. My tip is to watch the pancakes closely because it’s very important not to over-dehydrate them. If you let them go too long, you’ll end up with banana flax crackers. Your pancakes should still be moist, not crispy. It takes about 5 hours to dehydrate these pancakes in my dehydrator. It’s always a good idea to flip the pancakes half-way through the dehydrating time. You don’t want to end up with a pancake that has a dried out top and soggy bottom. Use a spatula to do this carefully so you don’t ruin the shape! 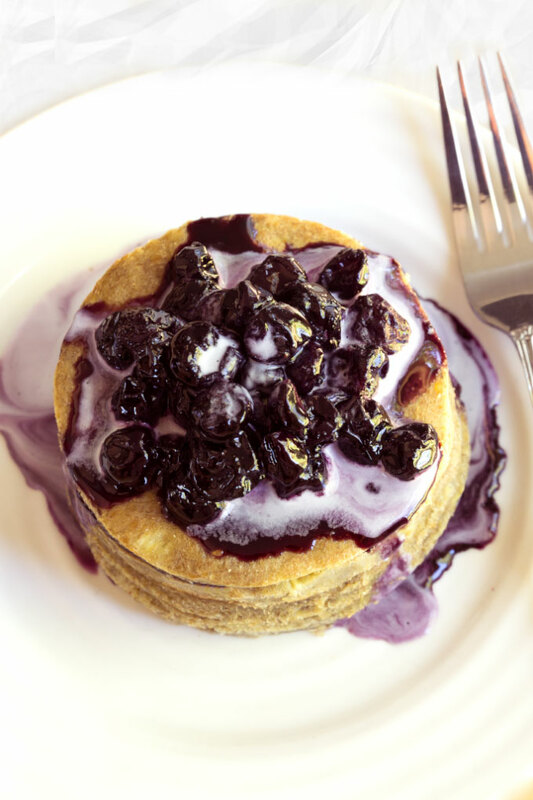 These raw pancakes are hearty and filling, yet soft and pliable. Flavored with bananas, maple syrup. vanilla, and a hint of cinnamon, your kitchen is gonna smell like heaven. Using a blender or a coffee grinder, grind the buckwheat grouts and golden flax seeds. Combine all the ingredients together and mix until everything is well incorporated and no clumps remain. If you want really smooth pancakes, run the batter through a blender for a few seconds. Pour in 1/4 cup spoonfuls onto a lined dehydrator tray. You should get about 5 pancakes. I like to pour the batter into large cookie cutters to get a perfectly round shape, but it's not necessary. Dehydrate at 115°F (46°C) for 3 hours. Then using a spatula carefully flip the pancakes and dehydrate for another 3 hours. Serve warm, straight out of a dehydrator. Store leftover pancakes covered in the fridge for 1-2 days, though best when fresh. Put the blueberries, maple syrup, and lemon juice into a small sauce pan. Stir frequently, and bring to a low boil. Simmer until the blueberry sauce is thick enough to coat the back of a metal spoon, about 5 minutes. *I made the buckwheat flour by grinding buckwheat groats in a Vitamix. **Depending on the ripeness of your bananas and on how absorbent the dry ingredients are, you might not need to use any almond milk. However, the batter does thicken up over time. If that happens, add a little more liquid to the batter. ***You can find the recipe for whipped coconut cream here. Hi. 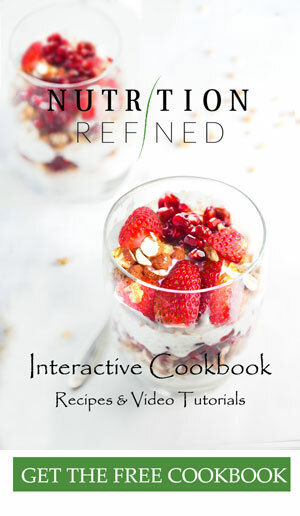 I would like to try this recipe; however, I don’t have (and think I will not get one) a dehydrator. Can I add more almond milk and make the pancakes in a regular pan? HI Keyla – I have never tried it so I honestly don’t know. I always make these pancakes in a dehydrator or the oven (baking them at 150 F). I do have a recipe for crepes though (https://nutritionrefined.com/recipe/sweet-crepes/) that can be made into regular pancakes. YUM! These look so delicious and perfect for brunch! Can’t wait to try this recipe! Love it. Your recipes are always so perfect. Do you think this will work if I replace the bananas with raw applesauce? Thank you so much, Alli! I have never tried it but I think it would work. The reason I prefer bananas in this recipe is that they have a lower water content than apple sauce. Apple sauce can make these pancake “wet”. So, if you do use apple sauce, I would recommend spreading the pancakes a little thinner or cook them a little longer. I had many bananas, so I decided to try this recipe! It was a very good idea for pan cakes! They are tasty, healthy, without sugar. We ate them simple and with home made Nutella. I can say that on the next day they are more tasty than the fresh and hot ones! And I made them slightly fried with your a little bit of coconut oil and baked in the oven as well. Great idea! Thank you, Petra! Amazing recipe. Can i use whipped aquafaba to make the pancakes lighter? Do i have to use buckwheat or can i use oats? And why? Thank you, Geraldine! Yes, you can substitute the buckwheat flour for oat flour (you might just need to adjust the level of moisture in the recipe). I have never tried making this recipe with aquafaba, so I’m not sure how it would affect the texture. Please, let me know how it goes if you give it a try.